Boulder Font | How to get to Fontainebleau by train, plane or automobile. If you live in mainland Europe just hop in, put Fontainebleau into your sat nav and you’re off. If you live in the UK you have a couple of options. You can either jump on the Euro Tunnel or hop on a ferry. Various ferry operators including P&O and DFDS, all run various routes between England and France. The shortest is Dover to Calais which takes around 90 minutes. The upside of driving yourself is that you save on the cost of car hire and if you fill your car with enough bodies it will be the cheapest way to get to Font. Once you hit France, head south but make sure you give Paris wide berth. You don’t really want to end up on the peripherique (the inner ring road around Paris) or even worse find yourself driving towards L’Arc de Triomphe. Trust me, I’ve done both of these things in the past. I’ve found the best route is to head south on the A1 an then pick up the A104 that skirts around Paris to the east. Here’s the route on Google Maps. The closest airport to Font is Orly which is situated in the south of Paris. It’s only 40 mins or so from Font. BA, Flybe and CityJet all fly here from various UK destinations. The next best option is to fly to Charles de Gaulle airport situated north east of Paris. Font’s around 1hr 15mins from here. Lot of discount carriers fly to here, including Easyjet and Flybe. Ryanair also fly to ‘Paris’ from the UK but will leave you in Beauvais which is about an hour north of the city and about 2hrs 20mins to Font. I’d only really head here if it’s the only route you can find or if it’s considerably cheaper than flying to one of the other airports. To get the most out of your Font trip you really need a car. 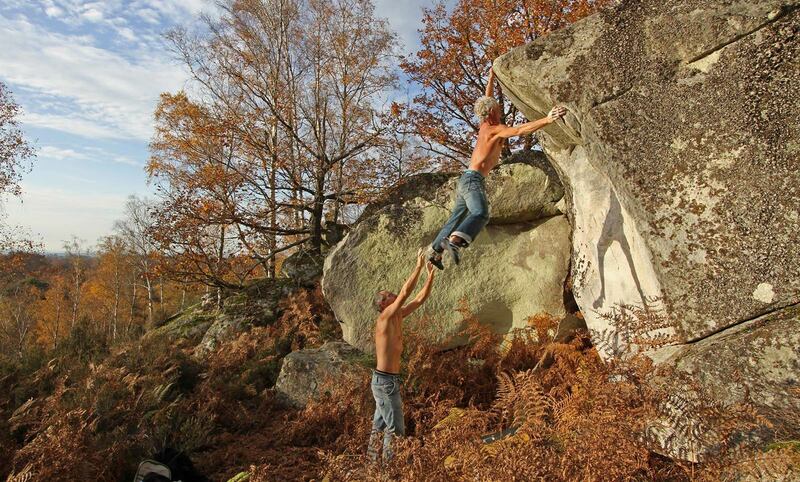 The bouldering is spread across a massive area and a car will maximise you climbing options. You can very easily hire a car at all of the above airports. A word of warning. Don’t leave anything in the car when parking as break-ins can be a problem from time to time. Try and park in the busiest, most visible part of the car park. If you have any changes or additions that you think would be good to include, just let me know. Thanks.